Air Engineering provides industry leading air end rebuilding as an alternate option to the high cost of a factory airend exchange. For over 30 years, Air Engineering has been rebuilding airends from 5 to 500 horsepower for every brand of rotary screw compressor & vacuum pump. Once the airend is received it is unloaded and taken immediately to the disassembly area, which contains mounting stand, overhead crane and oil pit for collecting waste oil. The job is then assigned a work order number, and a folder is generated for disassembly, teardown and spec sheets. This folder follows the airend through the entire rebuilding process to ensure accurate documentation. Once the airend is disassembled, all components are checked for wear & measurements are recorded. Pictures are taken identifying the problem areas. The disassembled airend is then placed in one of the self-contained cleaning systems. After the airend is completely cleaned & degreased, all parts that require work are brought to different areas of the shop and the repairs begin. 1. The front and rear covers can be metalized using the thermal ARC system & then machined by either the 20” or 36” Blanchard grinder. 2. The rotors can be mounted and turned on a lathe. Bearing journals can be metalized and ground according to specs. 3. 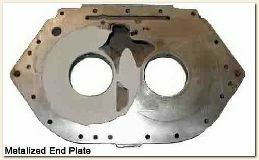 The main bore area can plated and bored on a vertical boring mill. 4. Seal strips can be built up and re-cut on a custom jig. Depending on the extent of the damage, the above work normally takes 1 to 2 days to complete. Before assembly takes place all the bearing pockets, bores, and alignments are rechecked. The two rotors are then checked for proper balance and alignment. The new bearings are re-measured for proper fit before installing. The airend is then completely reassembled. After assembly the airend is spun unloaded for a final check. To insure that the manufacturer’s specs are being met, the unit is continually measured and re-checked for accuracy. Upon completion all open ports are plugged with plastic caps and the inlet is taped shut. The airend is now ready to be skid mounted and painted the original O.E.M. color. As units enter the shipping area, all necessary shipping documents and start-up procedures are attached to the unit, and trucking details are arranged. This whole process normally takes 5 to 7 working days, depending on the size of the airend and the degree of damage. We have setup our shop so the work flows through on an orderly path to insure that all our inspection steps and quality controls are adhered to. All rebuilds are backed by our standard one-year, 8,000 hour warranty or our extended two-year, 16,000 hour warranty. See the airend warranty sheet for additional information.